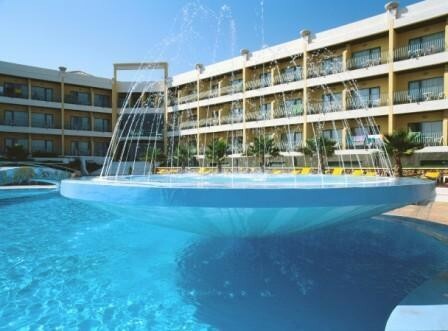 Relatively new quality Hotel with 131 rooms located on west side of Albufeira. Outdoor and indoor pools. Restaurants and courtesy bus to beaches and to Albufeira. Special discount rates online. The relatively new quality Hotel Baía Grande is located about three kilometres west of Albufeira on raised land overlooking the ocean in the Algarve, Portugal. The Hotel has 131 bedrooms that are composed of 80 bedrooms with sea view, 29 bedrooms with land view, 2 Junior Suites and 10 Senior Suites. There is one large outdoor pool and a heated inside pool, whilst the beach is about 800 metres from the hotel. A courtesy bus is provided for travelling either to the beach or to the local town of Albufeira. The facilities of the Hotel include the Albufeira Restaurant' for à la carte dining, the Mermaid Restaurant for buffet meals, and a snack-bar that services the pool terraced area. For social living there is the Piano Bar with light entertainment. All the rooms are air-conditioned, and fitted with mini-bars, hairdryers, safes, telephones and satellite TV and there are rooms equipped for disabled guests. For relaxation there is a sauna, Jacuzzi, and a massage room. Three conference rooms cater for up to 350 delegates.